The Original Handmade Photo Frame, with rich & Antique Design. Our matte silver plated sterling Silver Frames are crafted using the finest quality raw material. Available in the most exclusive style and antique look, our collection is a treasure to possess. Easy to clean and splendid in look, our wide range of frames is highly demanded by the globally based clients. Photo Frame with Diya in 925 sterling silver on a wood pedestal. We are known as a leading name in producing an elite range of Silver Photo Frames which are a live example of our craftsmen’s creative expertise. These beautiful photo frames are perfectly suited for gifting to near & dear ones. Design and price is subject to discussion. Kindly contact us on given contact no and address in contact details. In order to meet excellent quality standards, we are supplying Sterling Silver Picture Frame. Our company is engaged in offering wide range of silver photo frames, we offer these silver photo frames in different designs customer can avail these silver photo frames at leading price range. We are amongst the most reputed names in the industry, offering Sterling Silver Photo Frame. 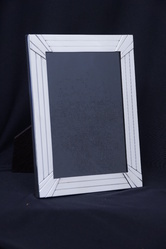 These beautifully crafted hand finished silver photo frames with their velvet or mahogany backs represent both exceptional quality and superb value for money. The most treasured moments are captured in photographs. Our fine sterling silver picture frames are an unrivalled way to preserve memories that should last a lifetime. 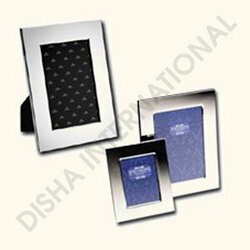 Banking on our enriched industry experience, we are able to supply Sterling Silver Photo Frames.